This is easily the best introduction to von Balthasar that I’ve read. Even better, there are two, 20 minute youtube clips with Karen talking through much of the key elements of the book! The first thing to note is the very reassuring assertion that von Balthasar is a difficult theologian to get one’s head around: phew! I wasn’t going crazy after all! It’s not that his work is difficult to read, but rather there is so much of it, laid out primarily as persuasive writing rather than systematics, so it takes a lot of work to get a sense of the whole accurate enough to commence critical reflection. Hence, many readers of von Balthasar tend to be uncritically embracing or uncompromisingly rejecting of him as a theologian. 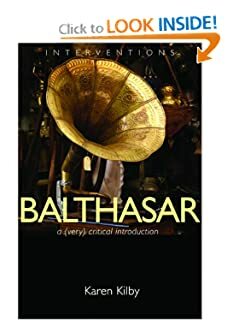 Kilby starts her introductory navigation of von Balthasar by offering a context for reading his work which, I concur, is critical because there is much that is unique about his life underwritten in his theology. First, he embraces the challenges of post-war Europe, with its wave of new thinking and being. It is an era negotiating the collapse of Enlightenment optimism and the emergence of existentialism together with the global economy. It is also an era of massive institutional change – both secular and sacred. Second, he was undoubtedly a brilliant man – a concert standard pianist with a brilliant memory; he devoured music, literature and theology in German, French and Latin, translating and publishing many of his favourite works. Not only this, was a creative, entrepreneurial man and a free thinker: he created ‘new’ pathways of theology and philosophy by synthesising the extensive resources he had at his disposal. Like any genius, I suggest that von Balthasar begins an epoch changing work rather than handing over a completed thesis, because such significant work can never to achieved in isolation. Third, Kilby draws our attention to three relationships von Balthasar had which exerted a significant impact on his writing: with Henri de Lubac, Karl Barth and Adrienne von Speyer. De Lubac situates von Balthasar as part of the ‘new theology’ (nouveau theologie) movement of the second half of the twentieth century which focussed on returning to early church fathers (ressourcement). His relationship with Barth draws our attention to von Balthasar’s engagement with theology and philosophy beyond his own Catholic house. Von Speyer, whom von Balthasar spoke of as his equal partner in the theological task, reminds us of his deep commitment to theology as spiritual experience. This relationship with von Speyer however, was exceedingly complex and justifiably controversial. In the next two chapters, Kilby offers us central images which permeate von Balthasar’s writings. 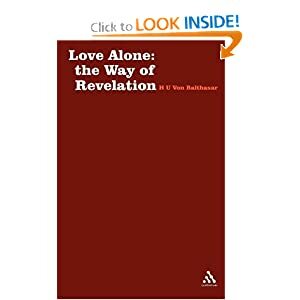 They are not a ‘key’ as such, like ‘the Word’ might be spoken of as the key to Barth’s writings, but they are ways of conceiving and articulating reality which von Balthasar returns to again and again. The first of these chapters explores the complementary images of ‘The Picture and The Play’; seen most clearly in his conception of a theological aesthetics and theo-drama. Similarly, von Balthasar’s confidence is expressed in the declaration of a ‘kernel’ of truth, a centre, the core from which many other insights and truths radiate out of or in towards. Kilby describes this as like a child’s drawing of a sun; a circle with lines of sun-rays drawn outwards at various angles and extensions. Aspects of ‘truth’ point towards a whole (because they emanate out from the whole) and very often we know only the individual lines. But if we follow them we eventually arrive at the kernel, that which is wholly true. This is an image which reflects something of my own emerging theological method, if the centre piece is left free and untameable. However, Kilby convincingly argues that von Balthasar fails to refrain from naming the unnamable. That is, he claims to know too much, even though his very own theological model directs him to do otherwise. Von Balthasar’s inflated ego ends up infiltrating the content of his theology. Hence, as Kilby presents von Balthasar’s ideas on the Trinity and on Nuptual Theology in the fifth and sixth chapters of this introduction, we begin to see there there is an element of over-reaching in his theological conceptualisions. For example, the cross is a Trinitarian event – von Balthasar articulates the relational nature of the godhead beautifully, but when he starts to explain how that makes The Father (in this instance) feminine in relation to Christ, we really do need to suggest he has overcooked the dish! Unfortunately, if we are to follow in the footsteps of von Balthasar, it needs to be a case of taking from what he says, when it comes to theological method, rather than what he does. For those of you who want to engage deeply with von Balthasar, I highly recommend Karen Kilby as a starting point. She is both succinct and balanced, making her very easy to read, which this excerpt – the final three paragraphs of Balthasar: A (Very) Critical Introduction demonstrate. I agree with her up till the last point: I do think that von Balthasar has something to teach us about how to be a theologian, but not as a guru. Rather, we can learn from him as a supreme example of doing theology in a particular way, (integrating spiritual experience, rational thought and faithfully reading and referring to the Tradition, both scripture and church from the centuries) but like all of us, he is flawed and his insights are partial. Hans Urs von Balthasar’s theology has over the past few decades attracted a great deal of scholarly attention, and he has come more and more to be presented as a major theological guide for our time. If the argument of this book is correct, then one must conclude, first, that the attention he has been given has indeed been justified, but second, that the notion that he might be a great guide, something like a Church Father for our age, has not. The scholarly interest that Balthasar’s writings have provoked is amply justified by the rich creativity of his thought. His writings break in many ways with our familiar theological categories; often he points towards fascinating new possibilities. We have not come to the end of exploring what his work makes possible, of receiving what he has to give, of thinking through where the lines of thought he begins should lead. Attention to Balthasar needs to continue. But, if I am right, it should be combined with a certain wariness, a readiness to question him, to wonder how he knows what he seems to know, to ask where he stands so that he can tell us what he wants to tell us. A recurring theme in Balthasar’s work, as we have seen, is the relation of the whole to the part, the whole to the fragment. In essence what I am proposing in this book is that Balthasar in fragments is important and worth pursuing, for there is much to learn from, to borrow, to think about, to develop. But when one tries to follow Balthasar as a whole, to treat him as one’s theological guide, as a contemporary Church Father, then he in fact becomes dangerous. If there is much to learn from Balthasar, the one thing in my view one ought not to learn from him is how to be a theologian.